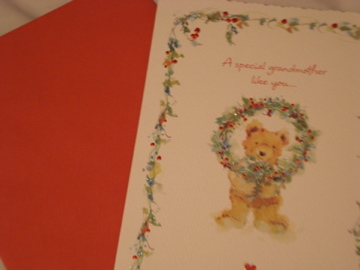 Today ,I bought a Christmas card for my grandmother on mother’s side. 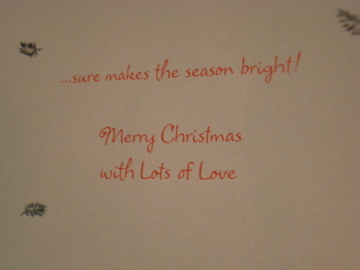 I decided to send the card and a present for Chrismas day. …sure makes the season bright! I really love my grandmother. She is always kind to me and I like to talk with her. Im sure that your granma will be amazed by your kindness. It doesnt matter what your present is !! Good decision ! I respect that ! I didn’t expect that you would say”I respect that”!! How are you!!! I knew that you had a blog but I couldn´t get the address when I was in Toronto and when I talk to you by messenger I always forget. But today I was reading Jen’s blog and I saw your page in the rollblog so… I’m here, writting to you!! Finally!! Since this moment, I’m gonna to do it frequently. I hope you are enjoying these last weeks. I miss you a lot guys!!! By the way, how is your hair-style… is it as beautiful as always??? Lots of kisses for you and for my prince, Yohei (I have seen that you write a lot in Shiori’s blog). I’m really happy to meet you here!! I’m gonna enjoy last 3 weeks in Toronto. but I haven’t found good shampoo since I came here. I hope I can see you again in this BLOG!! See you soon and take care! !